Most of the Bratz characters do not have official backgrounds. The ones that do are Katia, Fianna, Kiana, Kumi, and Jeanne B. Dolls released as exclusives in the UK and Canada are not necessarily the heritage of that country (except Jeanne B who is Canadian) and MGA has not confirmed the heritages of these exclusives, therefore they have been removed. Cloe- Nicknamed Angel. Blonde hair, blue eyes, light skin tone. She has been portrayed by Olivia Hack, Britt McKillip, and Skyler Shaye. Yasmin- Nicknamed Pretty Princess. Beauty mark underneath her left eye, brown eyes, tan skin tone, brown hair. She has been portrayed by Dionne Quan, Maryke Hendrikse, and Nathalia Ramos. Sasha- Nicknamed Bunny Boo. Green eyes, dark skin tone, dark brown hair. She has been played by Tia Mowry, Ashleigh Ball, Dorla Bell, and Logan Browning. Jade- Nicknamed Kool Kat. Light skin tone, black hair (sometimes pink streak(s)), brown eyes. She has been portrayed by Soleil Moon Frye, Alexandra Carter, Brittany Wilson, Britt Irvin, and Janel Parrish. Roxxi- Nicknamed Spice. Twin of Phoebe. Blue eyes, auburn (dark red) hair with black lowlights (often microbraided), light skin tone, beauty mark to the right of her lower lip. Roxxi’s beauty mark is absent in her 3D appearances. She appears in the Rock Angelz video game and movie, Forever Diamondz video game, also the TV series. She was voiced by Jessica Di Cicco. Fianna- Nicknamed Fragrance. Varying eye colors (usually green, brown, or blue), varying shades of blond to light brown hair, tan skin tone (but has also been produced pale). She appears in the Rock Angelz and Forever Diamondz video games, and also appeared in the TV show. She was voiced by Jessica Di Cicco. A model of Fianna is used in Forever Diamondz, Super Babyz and Sleepover Adventure. According to the TV show, Fianna is of Brazilian heritage. Katia- Nicknamed Flirty Turtle. Light skin tone, brown eyes, dark brown hair with black highlights. Katia was introduced as the 2005 Holiday doll and was later featured in the Genie Magic collection and DVD feature, as well as the 2006 Play Sportz and Hollywood lines. She appears in the Forever Diamondz video game. She was voiced by Tara Strong and is of Russian heritage. Sharidan- Nicknamed Sparklin' Sheep. Violet eyes, black hair, light skin tone, beauty mark to the right of her upper lip. She surfaces in the Forever Diamondz collection, movie, and video game, Movie Starz, and the Lil Angelz lines. She was played by Jessica Di Cicco. Nevra- Nicknamed Queen B. Blue eyes, dark brown hair, olive skin tone. The last collection in which Nevra appeared was Bratz Dynamite in 2005. She appears in Starrin’ and Stylin’. Dana- Nicknamed Sugar Shoes. Light skin tone, blue eyes, brown hair. She is referenced by Cloe in “Manicuring Candidate”, but did not actually appear in the animated series. Dana appears in Sleepover Adventure as a kid, but not as a teen in any other 3D films, though she did appear in Starrin’ and Stylin’. Phoebe- Nicknamed Sugar. Twin of Roxxi. Dark red (auburn) hair with black lowlights, blue eyes, beauty mark to the left of her upper lip, light skin tone. She appears in the Rock Angelz and Forever Diamondz video games. Meygan- Nicknamed Funky Fashion Monkey. Varying eye colors (often green or blue), light skin tone, varying shades of red hair. Sportz Teamz Tennis Meygan has brown hair, and a factory error led to some early batches of Sleepover Style Meygan dolls having blonde hair. She appears in the Rock Angelz video game and Starrin’ and Stylin’. She appears in Sleepover Adventure as a kid, but not as a teenager in the CG animated films, though Jade does mention her in the TV show. Meygan was voiced by Jianna Ballard. Maribel- Nicknamed Party Penguin. Brown hair with reddish highlights, blue eyes, light skin tone. She debuted in the Ice Championz/Bratz on Ice skating rink playset, and has since appeared in the Magic Makeup and Lil Angelz collections. May Lin- Black hair, pale skin tone, brown eyes. She was only produced once, as a Toys R Us store exclusive in the Bratz World Tokyo, Japan collector's collection. Her name was culturally inaccurate and considered offensive - May Lin is a misromanization of Meilin, a stereotypical Chinese name. Felicia- Nicknamed Glam Gecko. Brown eyes, dark brown hair with copper highlights, very dark skin tone. She has been produced twice as a Bratz and once as a Bratz Big Babyz. Oriana- Nicknamed Punk Skunk. Triplet of Valentina and Siernna. Light skin tone, blonde hair with brown lowlights, blue eyes. She has been only produced three times (3rd Edition Twiins, Triiiplets, Babyz Triiiplets). Siernna- Nicknamed Kickin Kool-ala. Triplet of Orianna and Valentina. Blonde hair with brown lowlights, light skin tone, blue eyes. The only one of the Triiiplets that has been produced outside of the set (Sweet Dreamz and Itsy Bitsy Babyz). She also appears in the Forever Diamondz video game. Valentina- Nicknamed Pretty Pup. Triplet of Siernna and Orianna. Blue eyes, blonde hair with brown lowlights, light skin tone. She has been only produced three times (3rd Edition Twiins, Triiiplets, Babyz Triiiplets). Krysta- Nicknamed Shine. Twin of Lela. Brown eyes, platinum blonde hair, pale skin tone. Produced only twice (4th edition Twiins and 3rd Edition Babyz Twiins). Lela- Nicknamed Fine. Twin of Krysta. Platinum blonde hair, pale skin tone, brown eyes. Originally nicknamed Vogue, this nickname had to be changed for release in the United States, presumably due to the trademark held by Vogue Magazine. Produced 5 times (4th Edition Twiins, 3rd Edition Babyz Twiins, 2006 Costume Party, 2006 Target-exclusive Babyz Holiday and Lil Angelz). Nona- Nicknamed Star. Twin of Tess. Brown eyes, dark brown hair, deep tan skin tone. Initial runs of Nona featured her with a deep tan skin tone matching that of Spring Break Yasmin, but subsequent runs had her with a lighter tan skin tone matching the usual skin tone of Yasmin. She has only been produced 3 times; 2nd Edition Twiins, 2nd Edition Babyz, and Lil Angelz. Tess- Nicknamed Solo. Twin of Nona. Dark brown hair, deep tan skin tone, brown eyes. Initial runs of Tess featured her with deep tan skin matching that of Spring Break Yasmin, but subsequent runs had her with a lighter tan skin tone matching the usual skin tone of Yasmin. She has been produced 4 times (2nd Edition Twiins, 2nd Edition Babyz Twiins, Lil Angelz, and 2007 Play Sportz). Kiani- Nicknamed Prankster Parrot. Little sister of Lilani. Hazel eyes, medium brown hair with dark blonde highlights, pale skin tone. She has appeared only in sets with her sister Lilani, once as a Bratz, and once as a Babyz. Lilani- Nicknamed Sweet Swan. Big sister of Kiani. Medium brown hair with dark blonde highlights, pale skin tone, hazel eyes. This character was the first to use a new taller body sculpt. She has been produced four times (Sisterz, Kidz Sisterz, Toys R Us-exclusive Kidz Fashion Pixiez and Kidz Back to School with the bus playset). Ciara- Nicknamed Spunky. Twin of Diona. Aqua eyes, deep cranberry and black hair, beauty mark, pale skin tone. She was produced only once (Wicked Twiins). Lina - red hair, purple eyes,light skin tone. Older sister of Dee, aunt to Breeana and Cymbeline. She has only appeared in the Fashion Pixiez line to date. Cymbeline- Big sister of Breeana. Older daughter of Dee and Melvino. Green eyes, dark red (reddish brown or auburn) hair, light skin tone. She is the same age as the Bratz and was voiced by Janyse Jaud. She does not appear in the Fashion Pixiez line with her mom Dee and sister Breeana, but appeared in the Fashion Pixiez DVD. Breeana- Little sister of Cymbeline. Younger daughter of Melvino and Dee. Reddish brown hair, purple eyes, light skin tone. Only appearances to date have been in Fashion Pixiez, as a Magic Hair styling torso, and in Lil Angelz. According to the Fashion Pixiez movie, Breeana is younger than the Bratz. She was played by Chantal Strand. Dee- Wife of Melvino. Mother of Cymbeline and Breeana. Platinum blonde hair, purple (blue in Fashion Pixiez picture) eyes, light skin tone. She was portrayed by Jillian Michaels. Only appearance to date has been in the Fashion Pixiez line. Vinessa- Nicknamed Stylin' Sheep. Brown eyes, tan skin tone, platinum blonde hair. She debuted in the Ice Champions/Bratz On Ice collection and has since appeared in Forever Diamondz, Design Your Own, 2007 Play Sportz, and the Kidz Winter Vacation snow lodge playset. Leah- Nicknamed Dainty Doe. Dark blonde to light brown hair, pale skin tone. She was initially to make her debut in the second wave of the Midnight Dance collection, but the cancellation of this release pushed her first appearance to the 2006 Spring Break collection. She has since appeared in the Sleep-Over collection, as a Big Babyz, and in the Fall 2007 line Fashion Stylistz. Kiana- Brown eyes, black hair, deep tan skin tone. Kiana was only produced once, in the Wild Wild West collection. She was discontinued because Mattel held a trademark on a character named "Kianna" in their Teen Trends doll collection. Kiana is of Native American heritage. Lana- Auburn hair, light skin tone. Babysitter to Babyz Alicia. Oddly enough, Lana's box art depicts her as a blonde. Only produced once, as part of the Babyzsitter set. Sorya- Blue eyes, strawberry blonde hair, pale skin tone. Her only appearance to date has been in the 2006 Rodeo collection. Lilee- Light blonde hair with reddish higlights, pale skin tone. Her first appearance was as the 2006 Sweet Heart. She has since reappeared in 2006 Play Sportz, 2007 Sweet Heart, and Lil Angelz. Tiana- Pale skin tone, black hair streaked with unnatural colors, brown eyes. Has only been produced 3 times (Tokyo-A-Go-Go Dance 'N Skate Club playset, Fabulous, and Lil Angelz). Raya- Nicknamed Funky Frog. Hazel eyes, tan skin tone, platinum blond hair. She has been produced twice; once in the Magic Hair Salon playset and once as a Lil Angelz. Trinity- Dark blonde hair, light skin, hazel green eyes. Her only appearances to date have been as the 2006 Holiday doll, and in Lil Angelz. Rina- Pale skin tone, varied eye and hair colors, beauty mark. Only appearance to date has been in the Bratz Design Your Own set, in which the doll came with 4 different heads, each featuring different hair colors, eye colors, and hairstyles. Nora- Lavender eyes, light skin tone, black hair. Identical twin of Nita. 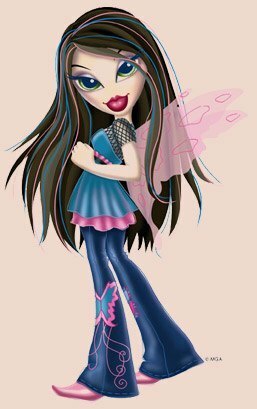 Produced once as a Babyz, she made her full-sized Bratz debut in 2007's Flower Girlz collection. Nita- Lavender eyes, light skin tone, black hair. Identical twin of Nora. Produced only once, as a Babyz. Amelie- Released in the Canada-exclusive collection, Bratz Haute Couture en Coulisse. Emy- Released in the Canada-exclusive collection, Bratz Haute Couture en Coulisse. Noémie- Released in the Canada-exclusive collection, Bratz Haute Couture en Coulisse. Adrienne- Nicknamed Glam Lamb. Triplet of Brigitte and Janelle (2nd Edition Triiiplets). Light brown hair, olive-green eyes, medium skin tone. Brigitte- Nicknamed Pretty Poodle. Triplet of Janelle and Adrienne (2nd Edition Triiiplets). Medium skin tone, light brown hair, olive-green eyes. Janelle- Nicknamed Chillin' Cheetah. Triplet of Adrienne and Brigitte (2nd Edition Triiiplets). Olive-green eyes, medium skin tone, light brown hair. Ariane- Light brown hair, blue eyes, tan skin tone, a beauty mark. She appears in Haute Couture en Coulisse 2nd Edition. Etienne- Brown eyes, black hair, pale skin tone. She appears in Haute Couture en Coulisse 2nd Edition. Marielle- Pale skin tone, blonde hair, blue eyes. She appears in Haute Couture en Coulisse 2nd Edition. Jeanne B- Black hair, brown eyes, light skin tone. Jeanne B is a Canadian-exclusive based on Canadian celebrity Jeanne Beker, and comes with a book entitled Passion for Fashion: Careers in Style, written by Jeanne Beker herself. Jeanne B is of Canadian heritage. Anna- Purple eyes, red (strawberry blonde) hair, pale skin tone. She was voiced by Carly McKillip. She appears in the Girlz Really Rock movie. She has not yet been produced as a doll. Sonya- Blue eyes, light skin tone, and blonde hair. She is one of three Bratz to date who wears glasses. She appears in the World Familiez collection and is Cloe's older sister. Portia- Brown eyes, tan skin tone, brown hair with gray streaks. She appears in the World Familiez collection and is Yasmin's mom. Destiny- Nicknamed Dynamite. Blue eyes, dark skin tone, caramel brown hair. She appears in the Fall 2008 Passion 4 Fashion collection. Kina- Nicknamed Twizt. Green eyes, light skin tone, black hair with light pink streaks. She appears in the Fall 2008 Passion 4 Fashion collection. Aubrey- Nicknamed Quiz Wiz. Green eyes, light skin tone, and black hair. She is one of three Bratz to date who wears glasses. She appears in the Fall 2008 Passion 4 Fashion collection. Peyton- Nicknamed Sweetie Cake. Black hair, blue eyes, light skin tone. Twin of Nevaeh. Debuted in the Bratz World Twiins set. Nevaeh- Nicknamed Tough Cookie. Blue eyes, light skin tone, black hair with red streaks. Twin of Peyton. Debuted in the Bratz World Twiins set. Anyssa- Blue eyes, light skin tone, brown hair. She is one of two porcelain dolls in MGA's limited edition Crystal Collection. Daphne- Green eyes, light skin tone, blonde hair. She is one of two porcelain dolls in MGA's limited edition Crystal Collection. Polita- Violet eyes, light skin tone, blonde hair. She is Cloe's mom and appears in the Bratz World Familiez collection. Emmanuelle- Blue eyes, light skin tone, blonde hair. She appears in the Designed By You line, and her design was chosen from entries in a contest held by MGA in Canada. Exclusive to the Canadian HBC family of stores (The Bay & Zellers). She is Canadian and named after the contest winner. Isa- Green eyes, light skin tone, red hair. One of Cloe's twin baby siblings; appears in the Bratz World Babysitter set. Nikki- Dark brown hair, brown eyes, light skin tone. Appears in the Designed By You line, and her design was chosen from entries in a contest held by MGA in Australia. Exclusive to the Australian market, she is named after the contest winner. Sabina- Nicknamed Rock Chick. Hazel eyes, pale skin tone, dark brown hair. Debuted in the Spring 2009 Passion 4 Fashion collection. Dresden- Nicknamed Miss Priss. Lavender eyes, tan skin tone, blond hair. Debuted in the Spring 2009 Passion 4 Fashion collection. Alek- Twin of Zack. 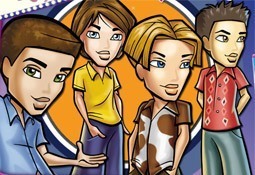 The Boyz Twins were featured on the official MGA website starting in 2005, and appeared in merchandising booklets packed with Bratz dolls sold during that time, but the dolls themselves never appeared in any retail outlets in the U.S. market. The Boyz Twins were very briefly available from on-line retailers based in Germany and Scandinavia in 2006. Braden- Black to brown hair, light brown eyes, medium to light skin tone. His first, and so far only, appearance is as Yasmin's date in the Bratz World Yasmin's First Date set. Bryce- Nicknamed "The Bear." Blond hair, green eyes (but blue in Bratz Genie Magic),he is one of three bratz to date to wear glasses, light skin tone. Debuted in the Secret Date/Blind Date collection, as a rare (1 in 24 boxes) character. Bryce's next appearance was as the only Boyz of the Hot Summer Dayz collection. His love interest was shown to be Katia in the Genie Magic DVD. He appears in Genie Magic; a model of him can be seen at Rockwater Springs, UT in Forever Diamondz & Fashion Pixiez. He was voiced by Adam Wylie. Cade- Nicknamed "The Viper." Black to brown hair, brown eyes, tan skin tone. He was produced with blond hair in the Boyz Play Sportz Baseball collection. Cameron - Nicknamed "The Blaze." Blond hair, light skin tone, blue eyes. His love interest was shown to be Cloe in the TV series and the Rock Angelz DVD. He was played by Charlie Schlatter and Stephen Lunsford. In the live action film, Cameron is portrayed with brown hair. He makes cameos in Genie Magic and Forever Diamondz and is named after the son of MGA Entertainment president, Isaac Larian. Dylan- Nicknamed "The Fox." Brown to black hair, varying eyes (often hazel), varying skin tone (early editions were a light olive, then changed to tan, most recent edition matches Sasha). He has shown interest in Breeana (Fashion Pixiez movie),Yasmin (Bratz the Movie),Jade (Starrin' and Stylin'), and Anna (Girlz Really Rock), even though in Girlz Really Rock, he refers to Anna as "the only girl I've ever loved." He was played by Ogie Banks, Adrialmes and Ian Nelson. Eitan- Nicknamed "The Dragon." Black hair (occasionally highlighted), light olive skin (has also appeared with a tan), brown, single-crease eyes. His love interest was shown to be Yasmin at the beginning of Rock Angelz and in the TV series. Eitan appears in Rock Angelz DVD & video game, the TV show, plus Bratz Girlz Really Rock; a model of him can be seen in Forever Diamondz. He was voiced by Josh Keaton and Trevor Devall. Koby- Nicknamed "The Panther." Medium brown hair, blue eyes, light skin tone. His love interest is Roxxi. Wayne- Tan skin tone, brown eyes. Colin- Blue eyes, medium skin tone, blond hair. Twin to Isa and younger brother to Cloe. Only appearance to date is as a baby in the Bratz World Babysitter set. Zack- Twin of Alek. The Boyz Twins were featured on the official MGA website starting in 2005, and appeared in merchandising booklets packed with Bratz dolls sold during that time, but the dolls themselves never appeared in any retail outlets in the U.S. market. The Boyz Twins were very briefly available from on-line retailers based in Germany and Scandinavia in 2006.